Exceptional User Experience is at the heart of SweetIQ’s Local Hub. A huge part of Alix Vander Elst’s day-to-day is collecting feedback from our Account Managers from our clients, and transforming that feedback into an optimal product. In this #LifeIQ spotlight, Alix tells us about her journey from graphic design to UX/UI, and the advice she always gives her design team when it comes to receiving intense feedback, as designers so often do. Let’s start with your background. Where are you from? I’m originally from Marseille, France. I grew up there and studied design before moving to Montreal. What lead you to design? Well — when it came to school, I wasn’t exactly great at any of the “traditional” subjects. I’m a very creative person. I remember this one time when I was meeting with my Guidance Counsellor to determine my next steps for my education; I was around 15 or 16 years old. He asked me what I liked, and I said I loved the arts and drawing. Not long after, my twin sister and I were en route to school. I specialized in Graphic Design after three years of studying. How was your transition into the workforce? Much of my initial work in graphic design was with IKEA, and a few other large freelancing contracts. IKEA was my first contact with User Experience and Customer Journeys, applied to the real world. I learned a lot there, and the manager I had at that time, Véronique Gonzalez, was a significant role model for me as a young designer. She taught me that a team is made up of individuals who wants to reach their own personal goals, and you have to do everything it takes to make that possible. When I moved to Canada, I decided that I wanted to stay put in Montreal, and not travel too frequently for work. I saw an opening at an agency for a Junior Web Designer. Ask any designer and they’ll tell you: web design is very — very! — different than graphic design. I consider them two very different fields, connected by the common thread of the user experience design strategies. As a graphic designer, you want the reader to be able to find their way in a magazine and leave with the feeling that they got what they were looking for, or they accomplished their objective with ease. It’s exactly the same for a visitor on a website, an app or a user interface. How would you describe that transition? It was intense at first. At the agency, I worked with the Art Director, but also Sr. Developer to better understand the development side — which is very key for web design. Two weeks into the job I was asked to code a WordPress site and I was like… ‘OK, how am I going to do this?’. A few months in, I transitioned to doing predominantly web design and not development. But that learning experience was vital and really prepared me for the future. I was lucky to work with Martin Thériault there, and I consider him a big influence on my career. He passed on to me his passion for web and interaction design. It’s such an alive and constantly developing field. Different users, different devices, different technologie, you always have to innovate! 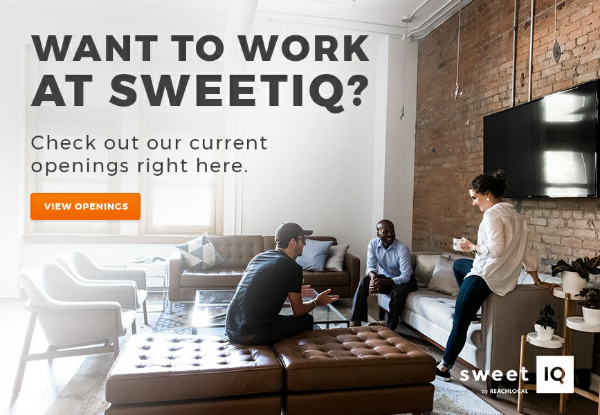 How long have you been at SweetIQ? Just under two years. I started as a UX/UI designer on a Product team of two people (!) with Emilie. Now, I’m Head of User Experience and Design and I manage four very talented designers. The team I’ve put together is my biggest achievement, they complete each other and they are doing an amazing job helping the company reach its goals. Tell me a bit about your day-to-day: what’s it like to work here? First things first: when I wake up, I’ll check my email to make sure there are no emergencies to tend to! After that, I get into work and I check on my team: are they happy? Are they secure? Do they need any support? Otherwise, I’m working on a lot of different projects with my team right now, that include continuing to develop our business identity, get feedback from our clients, Improve our UI, design new features or build new products. A huge part of my role is to make strategic design and user-experience decisions related to both core, and new, functions and features. That’s a lot time getting user feedback from other teams and clients so we ensure that we’re improving the User Experience for all of our clients. We don’t make any changes without feedback. Essentially, I look for problems and find ways to fix those problems! How much psychology is behind UX/UI? A ton. It’s very important to understand how psychology impacts design; you need to anticipate what your user will do and why they do it. Perception, attention, memory, environment and emotions, there are many factors that could affect your design and the user journey. I had no idea how much this specific aspect of business was driven by the way people think and react. It’s very interesting and there is always more to learn! My department is hyper-focused on the human mind and product usability. For those interested, there is a great community on the internet for UX designers. Check out great influencers like Jakob Nielsen or Jaime Levy. There are also thousands of great websites to understand what UX is about like Nielsen Norman Group or UX Magazine. You can also get inspiration from great designers on behance and dribble. Can you tell me a bit about your UX Mondays initiative? Yes! So, every Monday we share a tip or fact about UX to our team. This started a couple months ago, and it was born from a discussion I had with a team member who didn’t know about UX or its concepts at all. I consider a big part of my role here to be educating people about what we do and why, and opening them up to its principles. I think it’s incredibly powerful to always remember this: we definitely aren’t all designers, but we should all always keep the user in mind. By that logic, UX is relevant to everyone in the company. UX Mondays keeps the learning element funny and digestible! LifeIQ: What’s the best advice anyone has ever given you? Don’t be too attached to your project. It’s not your project — it’s your clients. As a designer, you aren’t building something for you; it’s for the company or for the client. If you want to build something for yourself, make personal art or write your own book. It’s always important to give your clients the best possible advice and fight for your ideas when you think you need to — but it’s never yours to own. Feedback is a big part of design. How do you manage all of the feedback coming in? Whose feedback is the most important? All feedback is important! The ability to digest feedback is something I always look for when I’m hiring a new designer. Design is the easiest thing to critique, because everyone can cultivate an opinion about the way something looks. By comparison, not everyone may know how to execute a campaign or write like a marketer, or code like a developer, so feedback isn’t of such intense volume there. I tell my team to remember that it’s not possible to keep everyone happy — but if you have proof through research that explains why you did what you did — and you can backup your decisions with evidence — then you can open up a discussion. My team has one major rule: everything you do has to be done with meaning! Know why you are doing something. If there’s no meaning behind it, don’t do it. My balcony at my house — it’s perfect and lovely. I spend a lot of time chilling there in the summer. Further afield, I love Village au pied du Courant in the summer, and in the winter… a cozy cafe. Want to work with talented people like Alix at SweetIQ? Check out our career openings right here.